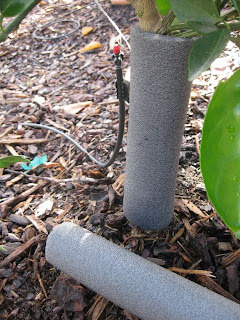 Besides the frost protection tips for citrus and other plants mentioned in previous posts, here are some relatively inexpensive tricks for raising the temperature a few degrees around your young citrus trees during this frost and freeze season. Tubular pipe insulation. Designed to keep your attic or basement water pipes from freezing, these can also protect the trunks of young citrus trees. One to three year old citrus tree trunks are very susceptible to freeze damage. The tree could die back to the root stock; but the root stock will quickly send up new shoots, resembling your pre-existing citrus tree...except for the nasty thorns, thicker leaves and ugly, tasteless fruit that rootstock growth will produce. Been there. Done that. Including a nasty thorn into the forehead. Remove the insulation at the end of the expected frost season to prevent any trunk rot issues from accumulated moisture. Lights can be used to warm the tree. Shine an outdoor-approved 100 watt lightbulb on the large limbs or trunk to warm the most mass. The larger, older Christmas bulbs will work, too. Newer ones, although more energy efficient, don't produce as much heat as the older ones. 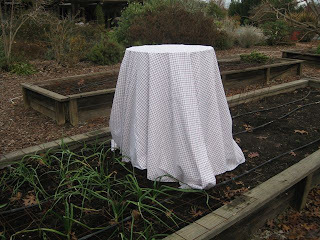 "If you use sheets or blankets, remove the coverings every morning when the temperature under the covering warms to 50 F. Permanently covering plants with sheets or blankets for the duration of the winter can be harmful. 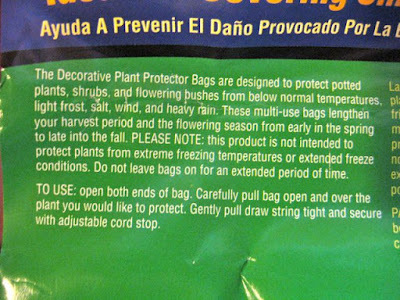 Even if the temperature under the drape does not warm up enough to 'cook' the plant, it is likely to warm up enough to cause the plant to break dormancy, begin actively growing, and thus become more susceptible to frost damage. However, many of the frost cloths available may be left on for extended periods without risk of harming the plant." And, simply throwing a covering over a citrus is not enough, adds the University of Arizona: "Completely drape the plant from top all the way to the ground. Do not allow any openings for warmth to escape. This procedure will trap the heat radiating from the soil and maintain a more humid atmosphere around the plant foliage. Optimally, the drape will be supported by frame which does not allow it to touch the foliage. DO NOT gather the drape around the trunk of the tree. The goal is to trap heat being radiated from the ground, so ensure that the drape touches the ground at least as far out as the drip line. And that brings us to one of the drawbacks of a relatively new frost protection product on the market, the frost bonnet: sort of a high-tech garbage bag, but made of a spun polypropylene fabric that cinches together at the top and bottom. 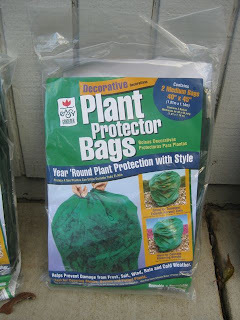 I'm trying these plant protector bags this year, but I am wary for several reasons: they are rather inexpensive (two 40" x 45" frost bonnets sell for about $8). The warning label, in small print, is not very reassuring. 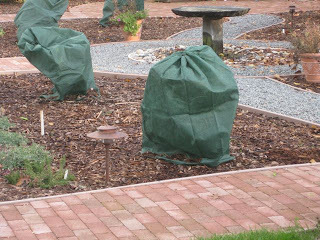 And, even though you can safely leave these coverings over the citrus plants throughout the winter (or can you? ), they look like the remnants of the Rotary Club's Saturday highway garbage cleanup drive. Oh, and because I forgot to anchor them securely to the soil, they blew off in a heavy wind last weekend. 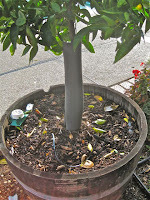 Keep the soil under the citrus tree well watered. Firm, bare moist soil absorbs more heat and loses it more rapidly than soil that is dry or covered with mulch or vegetation, according to the University of Arizona. Think twice before purchasing anti-transpirants or other products to spray on your citrus trees for frost protection. According to the University of Arizona: "A variety of chemicals have been marketed with claims of changing the freezing point of the plant tissue; reducing the icenucleating bacteria on the crop (thus inhibiting ice and frost formation), or affecting growth (extending dormancy). To this date no commercially available material has withstood scientific scrutiny." And if there is frost damage? Wait until late spring before reaching for the pruners. 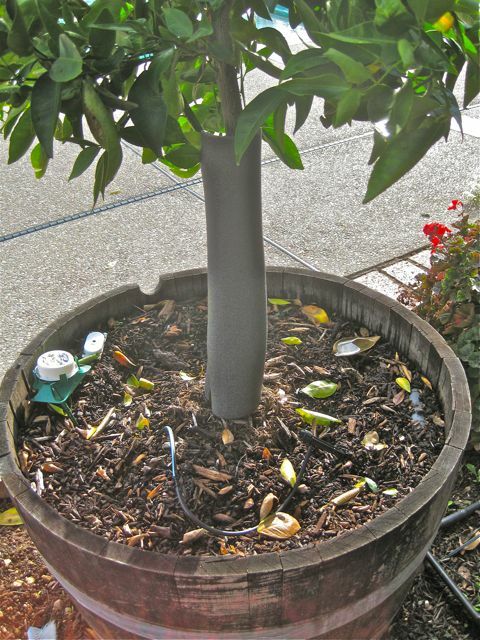 The damaged parts will be more obvious by then, so you won't accidentally remove healthy parts of the tree. 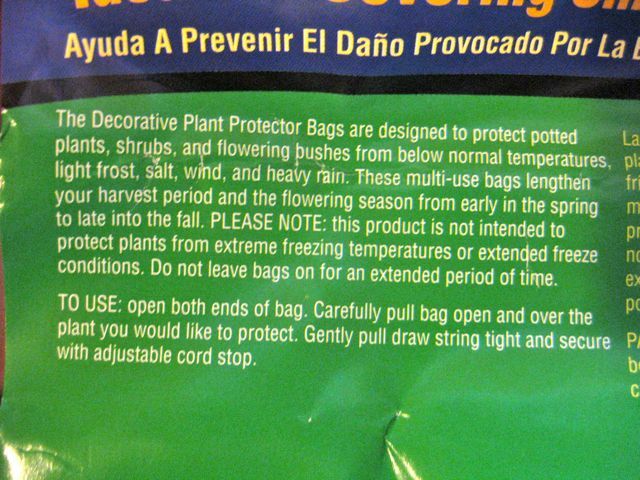 Any further research on frost bags since you posted this? I see Peaceful Valley is selling a bag hey say does not have to be removed. it has a drawstring, but I would not close it all the way as per the info from UA. We get down to the mid 20's. Other years I have used the christmas lights with mixed results. The tree is too big now to easily create a frame around it, and the lemons are not ripe enough to pick. Burning propane releases greenhouse gases that can contribute to climate change.